We are continually working to improve our product range. We have just released our latest product GLIMAX Professional for Glyphosate Max which is 450g/L of Glyphosate IPA salt, about as strong as you can get and designed for the professional weed control operative who knows on what and when to use it. The days of wholesale spraying are over. We need to work smarter and weed gels are the answer. Put the herbicide where it belongs, in the weed, not on you or your neighbours. Waiheke has a reputation of being the second weediest place on the planet after Hawaii and jokingly name Weedheke by biosecurity officers. I’m very pleased to see that the Local Board has decided to take a well balanced approach to weed control in reserves on Waiheke. The recent methodology without using herbicides is having a disastrous effect on the health of native bush. Taking into due regard the concerns of those that feel that herbicides are unacceptable, the Board has agreed on an approach that minimises herbicides using manual methods where feasible and carefully targeted methods of application otherwise. 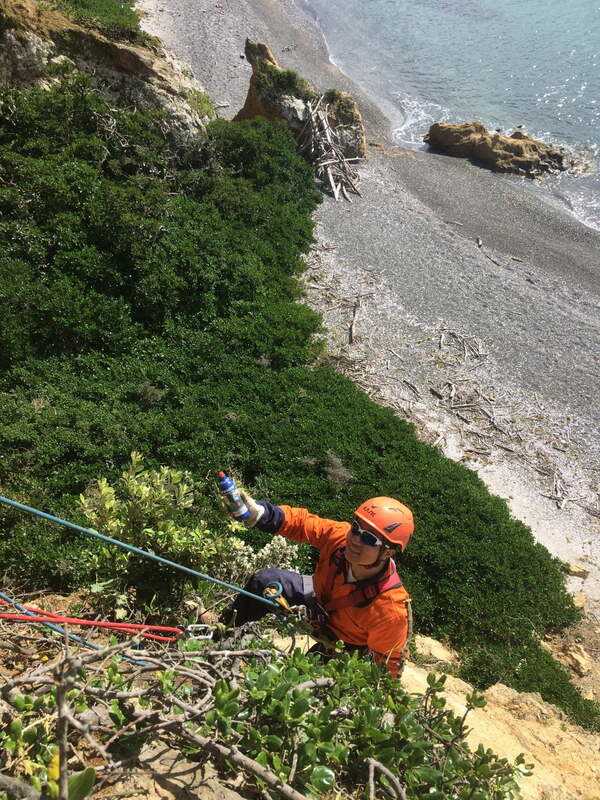 Treescape Environmental is an excellent choice of contractors who has done such excellent work on Rotoroa restoring a very weedy environment using a similar approach. Modern day Waiheke developed as a commuity of farmers and more lately holiday bach landowners, who, wanting some quick growing garden plants that stood the rigours of neglect between visits, introduced tough drought tolerant non native species from South Africa and South America. These could survive the rigours of summer and lack of care and proved excellent ground cover. Then through lack of attention, they were allowed to grow rampant. When the owners then periodically returned to their bachs, excess growth of these now weedy species ended up over the fence onto the neighbouring properties or the nearest reserve where they thrived happily and spread. As more and more land has been retired from farming the bush regrew, infested with these same weedy species. As the first ranger at Whakanewha Regional Park and later Biosecurity Officer for Waiheke, I was intimately, and often painfully, connected with the results of this first hand. Some of the park neighbours and others on the island who were firmly against the use of herbicides made a gallant, but short term effort, to tackle the legion of weeds by hand. Michael O’Flarerty was one I remember who persevered much longer than most, until acknowledging that it was futile and saying you can’t do this by hand, it’s just too much. From that time on, a variety of other approaches were tried and adopted. Sometimes it was simply better, more effective and easier to clear all vegetation and start again, replanting with natives as was done very successfully in many areas of Whakanewha and then minimal use of herbicides was needed to control the regrowth of weeds. Often the problem with herbicides is not the herbicide per se, but more the way in which it is used as well as the frequency. Whilst I was there, this work was carried out diligently and methodically with great results. Now many years of a combination of sheer persistence and the careful use of targeted herbicides, the park is in many areas substantially weed free. Some weeds are best tackled manually in the main, such as moth plant. Others, like climbing asparagus for instance, cannot be successfully controlled by hand, unless you are willing to provide the funds and man power to sieve every inch of ground to remove the numerous tubers. In between these extremes are a wide range of options. A skilled and careful weed control specialist understands these issues and adapts techniques and methodologies to suit the weeds and circumstances, using manual methods where feasible, followed by targeted herbicide application and sprays where there is no other reasonable option. I have had years experience of using herbicide gels and their safe application. Glyphosate is used an a wide variety of formulations, some of which are much more environmentally harmful than others. Roundup’s surfactant (detergent) formulation is very aggressive, so that it enters the plants system quickly. Using roundup repeatedly on an area of land is unwise as it reduces soil fertility over time by killing off first algae and then the food chain of organisms that depend on them. We don’t stop driving diesel cars or drinking wine, but these are proven carcinogenic chemicals that we either actively breathe in every day on the roads or are happy to drink quite regularly. We think that level of risk is acceptable because of the benefits. Without the ability to use of combination of methodologies the weed problems on Waiheke are insurmountable. The option of do nothing is not one that any environmentally conscious person would choose. Unattended weed problems do not go away, they simple continue to spread futher and further and more and more densely. Thank you again Waiheke Local Board for having the wisdom to take a balanced approach and for employing skilled contractors to use this kind of approach to restore Waiheke’s precious reserves. http://envirohub.org.nz/event/understanding-herbicides-a-short-course-for-people-using-herbicides-2/ A useful event for those wishing to learn more about herbicides. Hi Andy Just to say that volunteers are loving the Cut n paste....they feel so much more secure with this product than spray bottles. You probably realize that Weed Action has made its first purchase from you. Thanks for the initial free start up. Have a look at the latest Weed Biocontrol news. The tradescantia beetle is starting to bite into Wandering Jew. One of NZ's worst bush weeds has a new enemy.